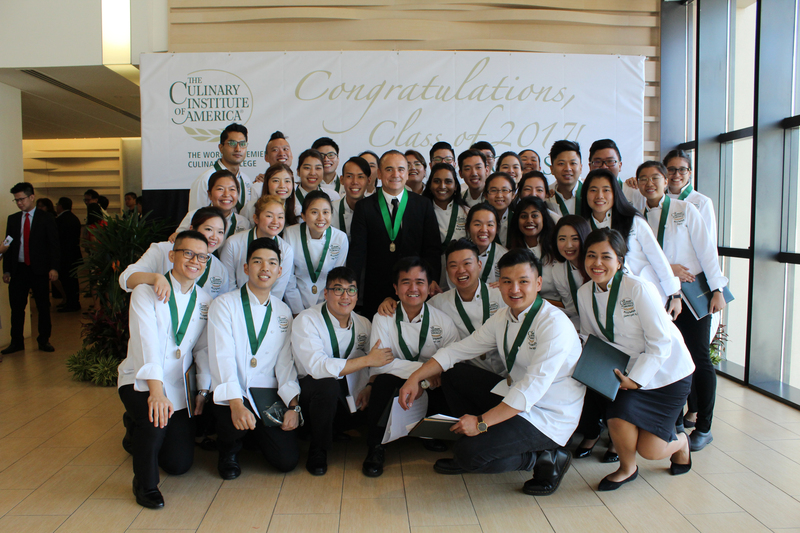 Singapore – Chef Jean-Georges Vongerichten, whose worldwide restaurant empire includes The Dempsey Cookhouse and Bar in Singapore, delivered the commencement address to graduates of The Culinary Institute of America, Singapore on 13 September. Twenty years after opening his first restaurant in New York City, Chef Vongerichten now has 37 restaurant concepts spanning four continents and 11 countries, including his native France. His original restaurant, Jean-Georges, is one of only six restaurants in New York City to be awarded the maximum three stars by the Michelin Guide. In addition to his restaurant in Singapore, Chef Vongerichten’s Asian restaurants are in Shanghai, Hong Kong, Tokyo, and Dubai. Chef Vongerichten received the CIA’s Augie Award for Professional Excellence and Innovation in 2014 and he won the James Beard Foundation Award for Outstanding Chef in 1998. His son Cédric earned a bachelor’s degree in Culinary Arts Management from the CIA in 2006. This class of 34 graduates began its CIA studies in partnership with the Singapore Institute of Technology in 2015 after completing a three-year polytechnique diploma programme. Credits from previous business management courses transferred, allowing students to complete their four-year degree with two years of the CIA’s unparalleled hands-on culinary training and certain required liberal arts courses. Founded in 1946, The Culinary Institute of America is the world’s premier culinary college. Dedicated to developing leaders in foodservice and hospitality, the independent, not-for-profit CIA offers bachelor’s degrees in management, culinary arts, culinary science, and applied food studies, and associate degrees in either culinary arts or baking and pastry arts. The college also offers executive education through its Food Business School along with certificate programs and courses for professionals and enthusiasts. Its conferences, leadership initiatives, and consulting services have made the CIA the think tank of the food industry and its worldwide network of nearly 50,000 alumni includes innovators in every area of the food business. The CIA has locations in New York, California, Texas, and Singapore. Singapore Institute of Technology (SIT) is Singapore’s university of applied learning. It aims to be a leader in innovative university education by integrating learning, industry and community. SIT offers applied degree programmes targeted at growth sectors of the economy. As a new university, SIT offers its own applied degree programmes with a unique pedagogy that integrates work and study. It also offers specialised degree programmes in partnership with world-class universities. To find out more about SIT, visit singaporetech.edu.sg.